If we weren’t quite fit enough for the mountain climbing in Arizona, we should be better when we return this year! 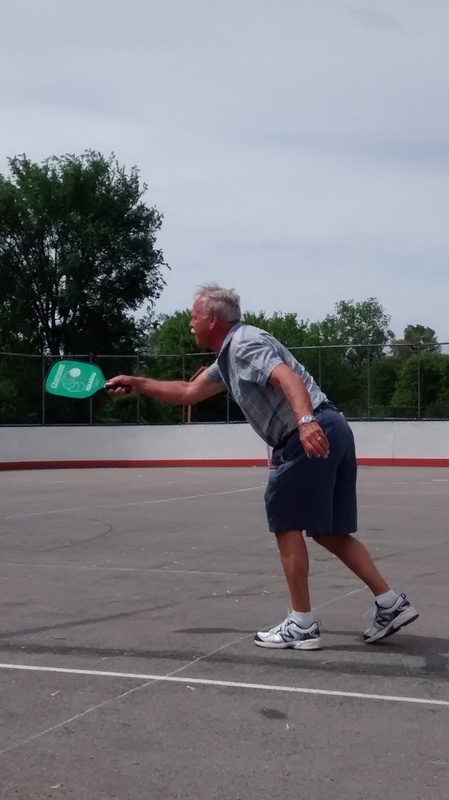 While we were at Mesa Regal RV Resort, we learned the basics of playing Pickle Ball. Yes, Pickle Ball. We get many odd looks and requests for explanation when we mention it. 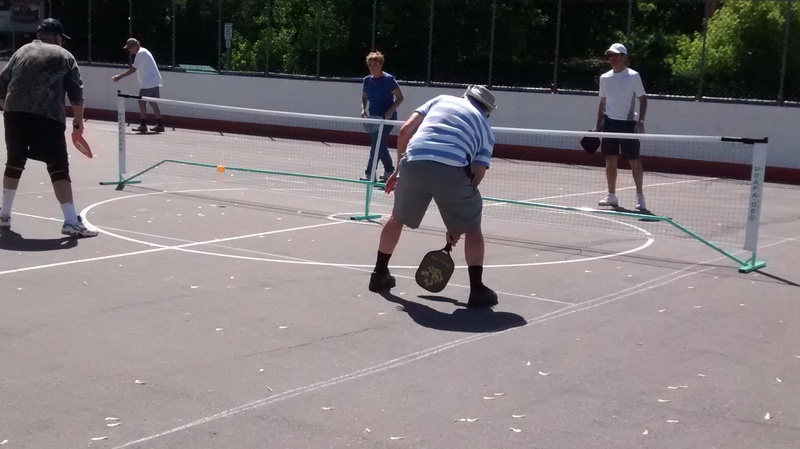 Pickle ball is best described as a cross between badminton and table tennis. 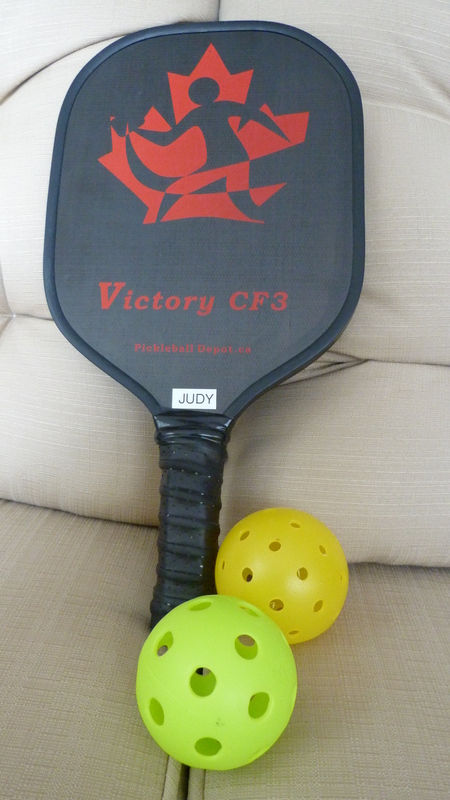 It’s played on a badminton-sized court with a low net and wooden or titanium paddles, similar to table tennis paddles, but a little larger. The game is played in doubles, using a whiffle ball. The story goes that the inventor of the game named it after his dog Pickles, who would chase and retrieve the balls that went too far astray from the court. When we were at the RV Resort we didn’t have any paddles of our own and there was always a waiting list to get some from the Loan Centre, so we managed to get in only two or three games before we left for home. To our delight, Karen’s family gave us a set upon our return, delayed birthday gifts. But would we have to wait until our return to Arizona to play again? We knew we needed to get active again or it would be a very long summer, so Jim did some searching online. He found a few older abandoned courts nearby, and then eventually was given the name of someone to call in Peterborough. A new group had recently formed and members were playing three afternoons a week at the Wellness Centre. We were there! We weren’t sure how we’d be greeted, our skills still very poor. But it turned out that there is a mix of players, some not much more practiced than we, and some who’ve been playing for five years. Most are snow birds who learned the game while wintering in the south. All were very friendly, patient and helpful with instructions. We played hard for two hours and crashed early that night. I needed a long soak in a salt bath before climbing into bed. But we felt revitalized. And so, we’ve become involved in the growth of this organization, sharing in the discussions and decision as to a name. Because there are times when the gym at the Wellness Centre isn’t available, an alternative venue needed to be found. One of the instigators, Greg Anderson managed to acquire permission from the city to use the pad at Legacy Bowl, a former outdoor hockey rink, on Monday, Wednesday and Friday mornings for two weeks. 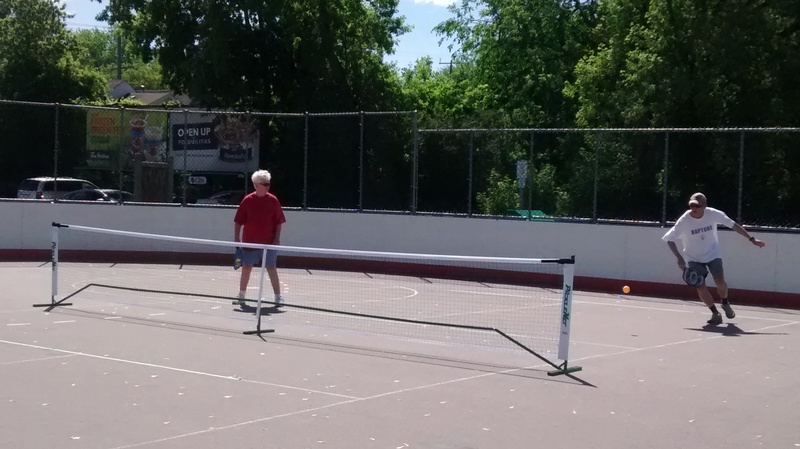 He has since been negotiating to make it a permanent site for @PickleBallPtbo. After six hours a week, for the last week and a half, we’ve learned at lot, and improved our skills and our stamina. It seems to be addictive. Although it is open to anyone who can find the time on a weekday morning or afternoon, so far we are all active seniors, with fifty people signed up. Not all make it out everyday, thank goodness. Where would they all play? 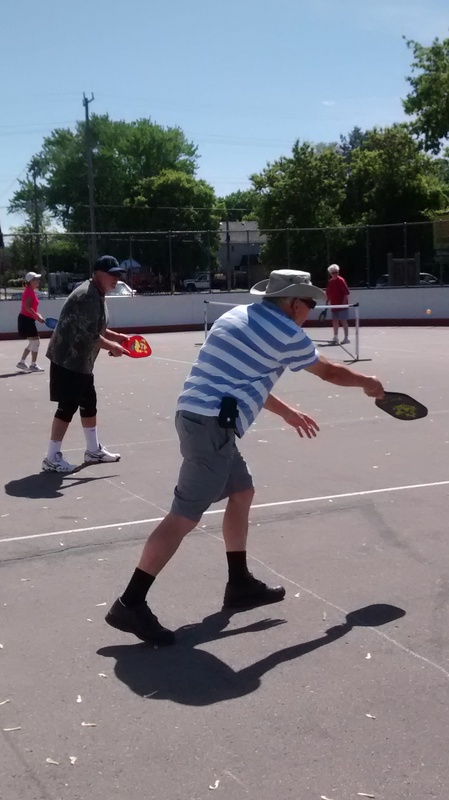 This entry was posted in Active Seniors, Community, Pickle Ball, Sports and tagged Peterborough, Pickle Ball, Pickle Ball Ptbo, Seniors, Sports. Bookmark the permalink. Reblogged this on Leisure Villas. Pulled a muscle in my foot……..walking! Missed Pickleball today. Hope to be back Monday. Sure will keep you fit. Sounds like great fun, but I think it wise for me to stick to ,my walking!! You two never cease to amaze me with what you find. Keep on having fun.